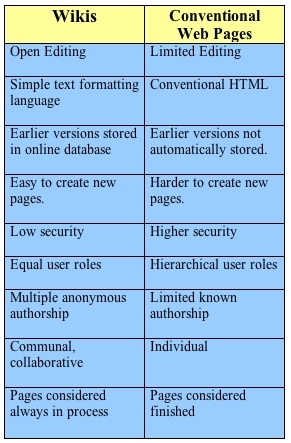 A wiki allows a group of people to collaboratively develop website with no knowledge of HTML or other markup languages. These people may know each other or they may be complete strangers who are all working together to create and edit a website. blank slate and are developed by the community of users who choose to participate. Anyone in the community can add to or edit anyone else’s writing. In theory, the final content should represent some sort of consensus within the community. Some wikis are open to everyone. This can become problematic when spammers or malicious people vandalize entries, but they are usually quickly fixed by concerned members of the wiki community. The community enforces behavioral norms, so that it doesn’t become a free-for-all. Other wikis are open only to specific groups like librarians, software developers, or participants in a class. These are wikis that are used to fill a specific need, and that need is how to find a way to easily collaborate and share information. Wikis are often used for intranets, research spaces, collaborative projects, creating documentation, and editing texts.